There has been something of a countdown going on for Sr Josephine Cannell, one which she readily shares. She knows exactly how many weeks until her 100th birthday on February 24 next year, and she marks the calendar down weekly. 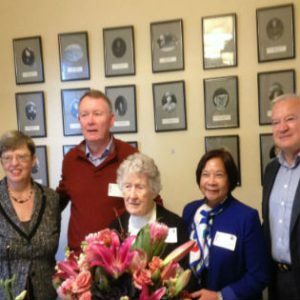 When she joined 20 other Sisters of Charity for the Mass, special liturgy, and other celebrations connected to the Sisters of Charity’s 170 years of service in first the Hobart penal colony and then the State of Tasmania, it was very special. 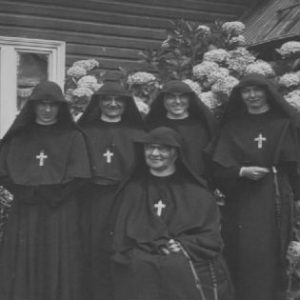 For most of the Sisters, the celebrations marked a return to the places they lived and ministered for many years; for Sr Josephine, it was a true homecoming to the place that faith was born and nurtured. As she talks about her life, her thoughts – logical, rich-veined with memory, and ordered – run across the history of the early 20th century in Tasmania, and Australia, from the time World War I finished, to the Great Depression in the early 1930s, and then World War II. It is quickly clear that her mind is acute, formidable. Sr Josephine was born and spent her earliest years in New Norfolk, Tasmania, “a little, tiny town in the Derwent Valley” she remembers, settled by evacuees from Norfolk Island when the prison there was abandonned in 1807. It’s the third oldest settlement in Tasmania, its historic past clear in the lines of many early buildings including one of Australia’s oldest pubs and Australia’s oldest Anglican church, St Matthew’s. These days, New Norfolk is about 35 kilometres away from Hobart, and 35 minutes by road. When Sr Josephine was growing up here, it was rather less accessible. There were a number of Cannell siblings – Monica, two years older than Sr Josephine, Kevin three years younger, and the baby Patrick, 18 months after Kevin. “Just after Paddy was born, Grandfather Cannell died,” Sr Josephine said. That was 1923, and the Great Depression was on the far horizon. “Unfortunately, my father decided to change his job, and things were just going down and down. My mother decided that something needed to be done. In 1925, there was an ad for a job in a Hobart foundry, which he applied for and got.” Her father commuted for a short time, coming home for the weekends, but the family soon followed to live in Hobart. 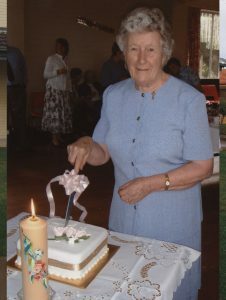 “I was fortunate to have both parents Catholic,” said Sr Josephine, who while she had started school in New Norfolk at the local State school, had been encouraged by her mother to visit the church across the road. This is where she encountered Sisters of Charity for the first time. 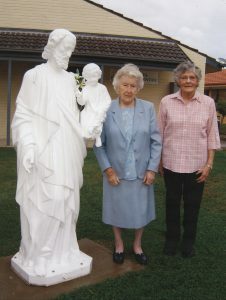 When the family moved to Hobart, Sr Josephine and her sister Monica were enrolled at St Joseph’s Convent, which was under the care of the Sisters of Charity. As she approached secondary school, the Depression bit. “In 1928, 29, 30 – things were very bad in those times in Hobart,” she said with restraint. Her mother soon had a visit from the Sisters, and passed on the gist of the formal conversation she had with them to Sr Josephine. “She told me that the Sisters thought I had a vocation. Dead silence. Mum asked me what I thought, and I said ‘Yes, Mum’.” That response came from certainty, and, as such, it was a relief. She remembers standing on the ship in Hobart as it slipped its moorings and headed out of the Derwent for Sydney. The family, gathered to wave goodbye from the dock, became smaller and smaller. She was professed in January, 1937, after two and a half years of studying and learning about religious life. Teachers college followed. Her life as a teacher began, and was as unpredictable as it was interesting. “Whatever happened was God’s will, and I never questioned it.” She took her final vows in 1940. She has acute recall of many of her postings as a teacher, which were mainly in the arts and crafts area. She followed renowned artist Justin O’Brien as the art teacher at St Joseph’s Edgecliff when Justin left Australia to become an official war artist. 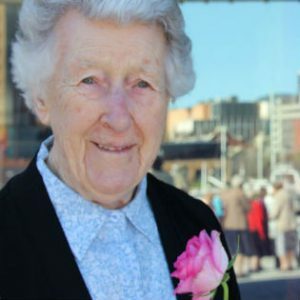 At the end of 1940, she moved to Melbourne and remembers clearly the troops being moved at the same time. Her teaching stints in Melbourne included periods at the Catholic Ladies College, East Melbourne, St George’s in Carlton, and St Teresa’s and St Columba’s in Essendon. She remembers particularly four wonderful years at CLC, during which she taught two young women who would go on to become Sisters of Charity themselves – Sr Deirdre Hickey, and Sr Elizabeth Costigan. After 12 years in Melbourne, she was moved back to Sydney, first at St Mary’s Cathedral School, and then at St Vincent’s Potts Point, where she was in charge of the boarders’ refectory and kitchen. It was a change which lasted two years, until she was sent to teach in Katoomba. 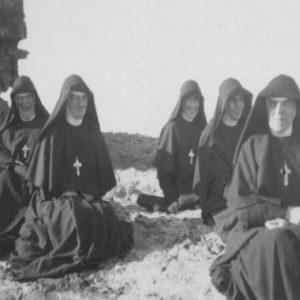 The time came, though, when Sr Josephine began to dread the appearance of the envelopes which invariably contained another change of location. She has excellent recall of those ministries, those locations, and can run them off without reference to a note. During her long ministry life, there were many different schools and roles. And she kept on creating. Ten years ago, during her final stint in Tasmania, she published a book, a labour of love, to commemorate the 160th anniversary of the arrival of the first pioneer Sisters in Van Diemen’s Land. Entitled To the beckoning shores: Urged on by the love of Christ. 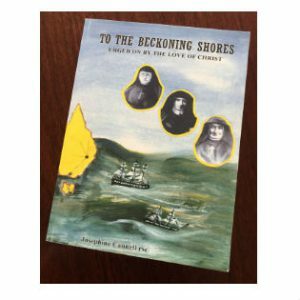 Dedicated to the memory of the three pioneer Sisters who arrived in Hobart aboard the Louisa in 1847, it relates an intriguing story, one of sacrifice, dedication, and love. Not only did she research and write the story of those 160 years, drawing on sources from Hobart to the Archives in Sydney, but she also designed the cover, and took the lot – loaded onto a USB stick – off to the printer. Not bad, for 90. She left the community in Tarooma in August 2014, taking up residence in Mononia in Fitzroy. Sr Josephine remains self-deprecating to a fault. For her Oak Jubilee celebrations this year, the priest asked her for details of her life and career for his homily. “He wanted to know if I had ever been a principal, ever run anything. I told him not really,” said Sr Josephine. She might have been right, but that does not tell the whole truth about the remarkable Sr Josephine. Today, Sr Josephine spends her time in quiet appreciation of all that has been, and remembers in prayer the needs of the Congregation and the world.